I had no idea Chloe knew the Pledge. Ninnie and Big Poppa brought her home from spending the night, and Ninnie was talking about it. I thought she was kidding at first until she had Chloe say it for me. I couldn’t believe it! Chloe told me they say it every morning at school. I had to get it on video! Here’s a “warming of the heart” picture. Every night after baths, we all pile in Chloe’s bed for story time. At this point of the night, I think I’m more tired than the kids, but it’s one of my favorite times of the day – even though it ends up being quite crazy. Both kids are clean, they smell yummy, and Chloe will cuddle close and listen to every single word I read. Cole will cuddle and listen for about 2.2 seconds, then he will start jumping on the bed screaming, “Ook (Look)! Ook at me!” Chloe is so good at ignoring him, and when Cole realizes he is being ignored, he will usually sit down a few seconds and listen before hopping back up and doing the same thing over again. It really is quite comical. When all the stories are read, I will tuck Chloe in the bed. Cole will lie down beside her and tuck himself in, and every night he asks if he can sleep with Chloe. And, every night I tell him no. Then, I have to grab him to get him to leave her bed, but before he leaves, they get silly and always hug and kiss a few times. I got the camera out tonight when they did this because I know one day I will miss these bedtime ritual of theirs. Chloe is a lot like me when I was little. I loved school. (Actually, I still love school and would love to go back to school). Chloe’s sad on the days we don’t go to school, and every night she asks if it is a “school night.” And now, she asks me all the time if she can do homework. 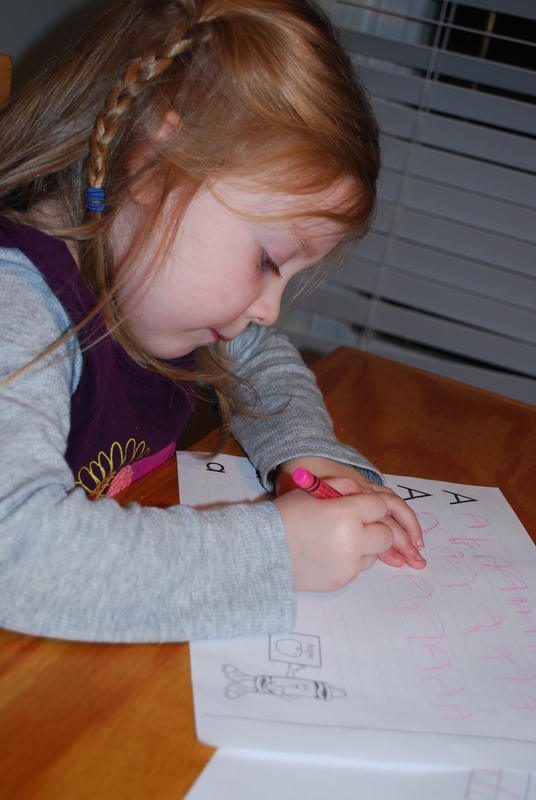 She will sit at the kitchen table and “do homework” for longer than I would think a 4-year-old would want to sit still. 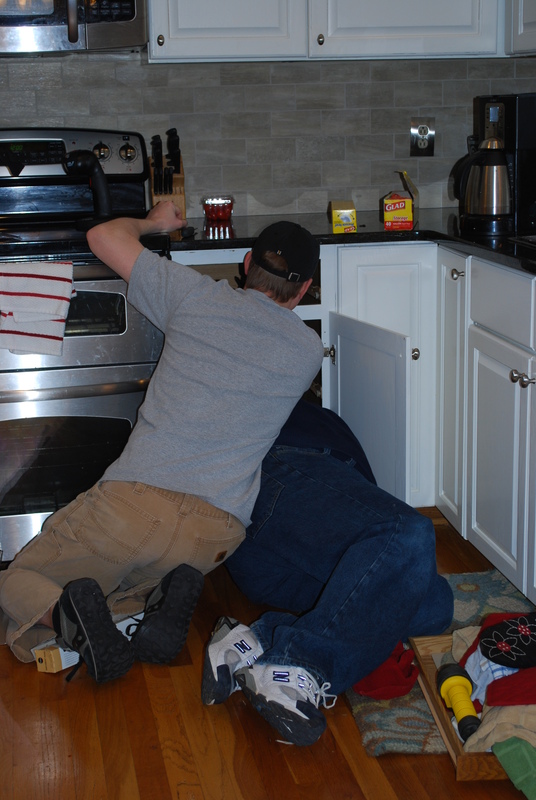 I needed a handyman(men) to help out with a little job in the kitchen, and I brought it up when Big Poppa and Ninnie stopped by today. I really didn’t think the job would be as big as it turned out to be, but it took several hours and a couple of trips for supplies. 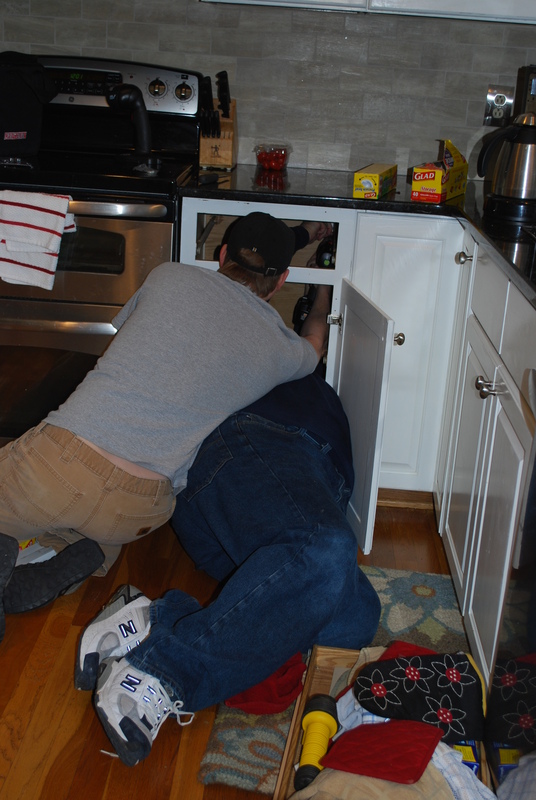 These pictures don’t do justice, but I got to sit back, laugh, and get a couple of shots of these handymen at work. I wish you could have heard the conversations going on between these two, but I won’t get into that because the fussing and cussing (which got worse when they heard the camera clicking) would keep my blog from being G rated. I am so sick of cancer and kids with cancer and brain tumors and brain cancer…..
Just last week a lady from home that we have been following died from brain cancer. She was diagnosed 4 months after Dad. And now, there is sweet Lucy. Lucy’s mom is Kate. Kate is my same age and went to my rival high school. My first cousin is married to Kate’s first cousin. Kate’s daughter, Lucy, is 5 years old. In 48 hours, Lucy started vomiting out of the blue and was soon unable to walk. Within those 48 hours, it was discovered Lucy had 3 brain tumors, 1 tumor on her spine, and a sprinkling of tumors down her spine. No other symptoms occured until the vomiting started. It has just blown my mind. My heart is so heavy for this family, and I just can’t get them out of my mind. It is truly heartbreaking. Kate and her husband have an older daugter and a 5 month old son. Lucy had brain and back surgery today to remove the large tumors, and even though the surgery went well, Lucy is in a lot of pain. They have a meeting scheduled with St. Jude, and Lucy will have to endure aggressive chemo and radiation as soon as she is able. They all have a long, long, long road ahead of them. Well, it is another darn snow day today. What is this?? Snow day #10?? I am completely over the snow at this point, and I am completely over taking half an hour to get everyone dressed to get outside only for Cole to completely melt down and want to come inside after 10 minutes. But, once again, my kids couldn’t wait to get out in the snow. 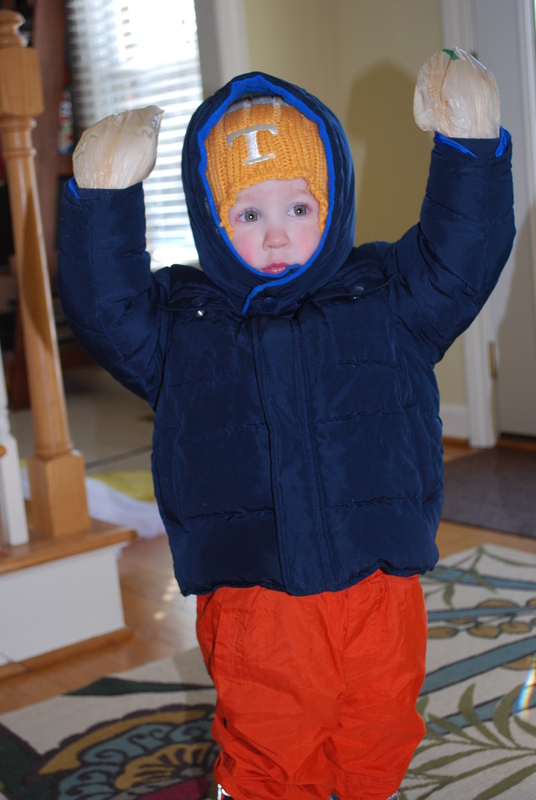 For some reason (probably because he was listening to his sister’s incessant begging), Cole was ready to get bundled up and get outside. To make this playtime worthwhile, I knew I had to find some type of solution to Cole ripping off his mittens and/or gloves. 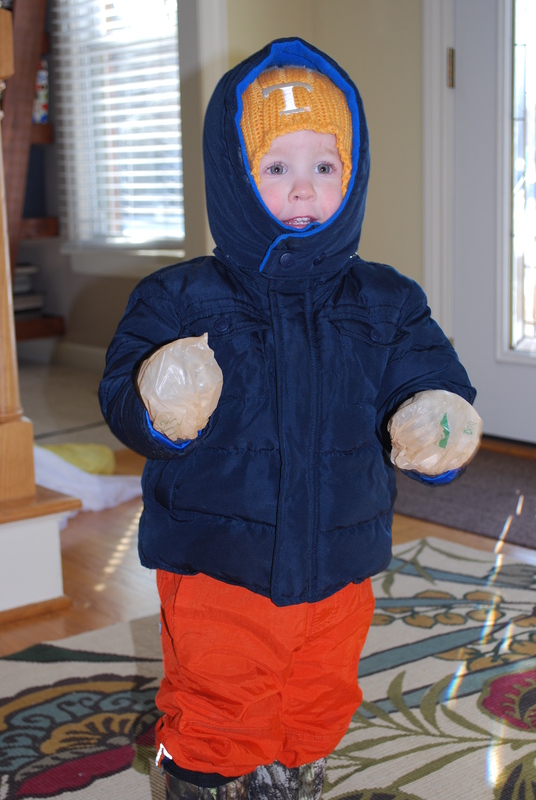 I finally found something that worked…..
First, I put a pair of socks on his hand and then his mittens. Then, I put grocery bags around that and tied them on really tight. Next, I put on a thermal shirt, a regular shirt, a sweatshirt, and his jacket ALL over his tightly tied grocery bags. And guess what?!?! He couldn’t pull the bags off even when he tried! We made it outside a whole entire hour before he completely lost control. Progress was made! 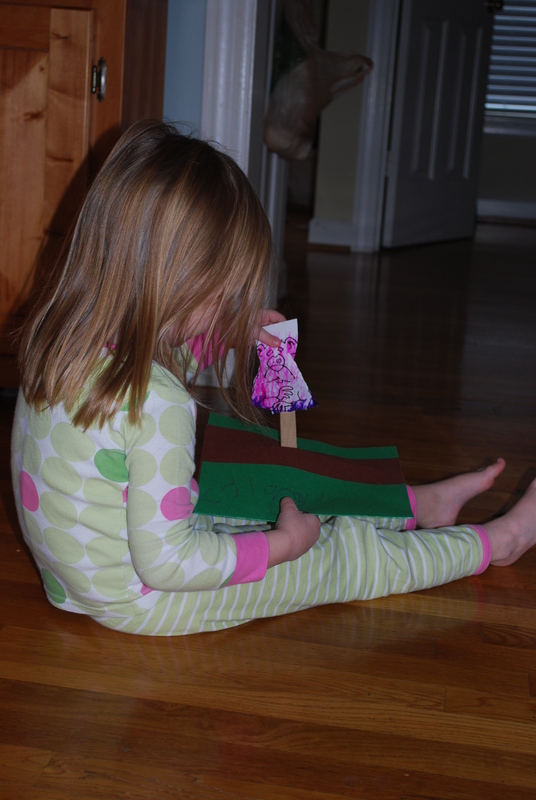 According to Chloe, her class made brownhogs at school yesterday for Brownhog Day. Interestingly enough, her browngog is purple.